Last I checked, this anime was available on DVD at Amazon and DiscountAnimeDVD.com. The above info came from tateishi ayu, and was edited by yours truly (contact me). The image came from Asylum Anime. Hideo Middle School eighth-grader Ayu Tateishi of the tennis club is a cool and popular girl among some of girls in school. But she's just an ordinary girl pretending to be cool, because her long-time crush, ace of baseball team, Kaji Tatsushi, likes her. Enter Nina Sakura, a young witch from Magic Kingdom. With her magic computer and magic treasure box, she uses magic to help Ayu, and to find the Holy Stones which she needs to collect for the Princess Contest in Magic Kingdom. Nina and Ayu were best friends. There's also the cute and stubborn, Hiroki Tsujiai, Kaji's best friend and the first guy ever to find out about Nina's magic. There's Maya Orihara, their classmate, which turns out to be another witch from Magic Kingdom! Orihara is also a candidate for princess and a rival of Nina for the Holy Stones. 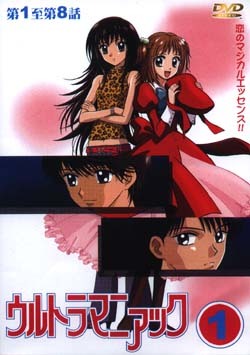 A romantic magical comedy created by Yoshizumi Wataru, Ultra Maniac! Watch it and you'll be fascinated! The above description came from tateishi ayu, and was edited by yours truly (contact me). Ultra Manic is an anime about a kid witch named Nina Sakura and her best friend Ayu Tateishi. Nina came from Magic Kingdom to visit the human world so she could collect all five holy stones so she'll be able to marry the prince in a Magic Kingdom and become a princess. But when she collected all five of them, she suddenly changed her mind in becoming the princess of Magic Kingdom (see for yourselves why). The above description came from anyone, and was edited by yours truly (contact me). Ayu was a normal girl that never believed in magic. Then one night she encountered Nina, a kid witch from Magic Kingdom with her talking cat, Rio. Soon Ayu and Nina became best friends, along with Kaji and Tsujiai who also find out that Nina is a kid witch later in the series. Nina is determined to get the Magic Stones which will make her the Prince's bride. But when she does, she no longer wants to marry the Prince because all of her friends who helped her would have to have their memories erased. So Nina comes back to Ayu's world and everybody's happy. And soon the Prince marries Maya, his childhood love. The above description came from Kalene Kon, and was edited by yours truly (contact me).